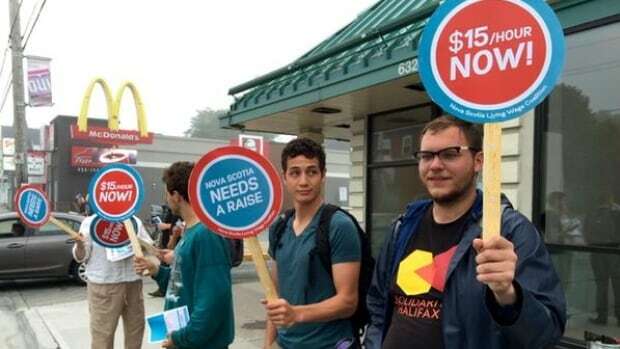 A group of people from social justice organizations in Halifax protested outside McDonald's on Quinpool Road calling for $15 minimum wage Wednesday morning. Darryl King, of the Nova Scotia Fair Wage Coalition, says they picked the fast-food restaurant to support the employees. "The big thing is dignity back to the worker," he said. "It's really hard. I can vouch for that myself. It's hard struggling just to pay the bills day in and day out just to take care of the essential needs — food, clothing shelter." King says $15 an hour would help alleviate some of the stress and allow people to re-invest in local economies. About a dozen people from the Association of Community Organizations for Reform Now (ACORN), the Canadian Federation of Students, and Halifax District Labour Council, handed out pamphlets for about a hour. Lisa Fairn says every month she struggles to pay for heat, lights and hot water on a fixed income. "I'll be the first to admit it that I pan once in a while because I don't get the right amount of money to live off of," she said. "People deserve better." McDonald's Canada responded to the protest in an email to CBC, saying the company looks to "individual provincial legislators to determine appropriate minimum wages across the country." The province's minimum wage rose 20 cents to $10.60 an hour in April. Minimum wage rates are adjusted annually in Nova Scotia and are based on the previous year's national Consumer Price Index. Across Canada, minimum wages range between $10 and $11 an hour. The Northwest Territories has the highest, it rose to $12.50 June 1.